US Airways is a leading American airline which offers flights throughout the United States as well as international routes throughout Europe, Asia, and South America. In 2013, US Airways officially began a merger with American Airlines, the terms of which state that the US Airways brand will eventually be discontinued. Meanwhile, US Airways and American Airlines have integrated their frequent flyer programs. US Airways has received exceptionally negative reviews from flyers who decry its high service charges and low standard of service. 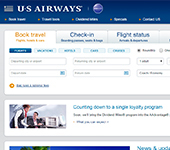 Despite the negative reviews, US Airways actually offers one of the most simple and user-friendly websites in the industry, with clear sections to book a new flight, complete and online check and print a boarding pass, see flight status via an easy-to-use flight tracker, and consult your past reservations. 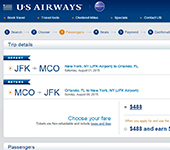 The US Airways website also offers detailed information on the company's baggage fees policy ($25.00 for the first checked bags on flights to the US, Mexico, and Caribbean, while long-haul international flights allow for one free piece of checked baggage). As mentioned, US Airways' Dividend Miles frequent flyer program has been discontinued and the company now participates in American Airlines' AAdvantage program. 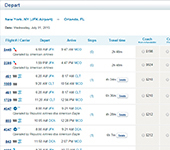 Dividend Miles customers' miles are fully redeemable via the Aadvantage program. Where is US Airways located?